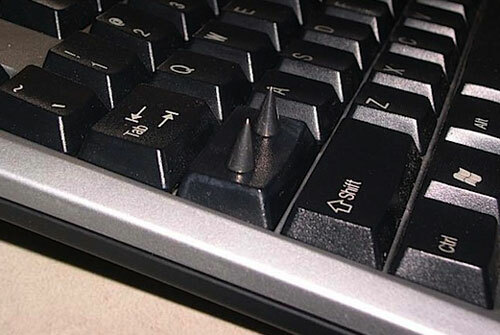 Caps Lock Key Trainer Key HAS GIGANTIC SPIKES (ow) | OhGizmo! Kids, listen closely: just because you’ve mashed the caps lock key down when typing something on the internet doesn’t mean that your comments have any more relevance, or that anyone is more likely to pay attention to you. It’s just really, really, REALLY ANNOYING. If you can’t help yourself, here’s a gentle suggestion: bolt a couple fourteen-gauge 10mm lebret spikes onto the caps lock key, and see how long it takes for you to cure yourself of your affliction. Not recommended for laptops. I actually removed the capslock key from my keyboard- I was tired of accidentally hitting it and looking up to see that I'd written a whole sentence in all caps. The key should have been omitted from keyboards a long time ago- it's useless!